OpenAI used the action at this year’s Dota 2 championships as an opportunity to show off its work by having top players lose repeatedly to its in-game bot. Dota’s normally a team game with a heavy emphasis on coordination and communication, but for players interested in beefing up their pure, technical ability, the game also has a 1v1 mode. That’s what tech company OpenAI used to show off its programming of a bot against one of the game’s most famous and beloved players, Danil “Dendi” Ishutin. That mode has both players compete in the game’s mid-lane, with only the destruction of that first tower or two enemy kills earning either side a win. In addition, for purposes of this particular demonstration, specific items like Bottle and Soul Ring, which help players manage health and mana regeneration, were also restricted. Dendi decided to play Shadow Fiend, a strong but fragile hero who excels at aggressive plays, and to make it a mirror match the OpenAI bot did the same. Rarely do you hear a crowd of people cheering over creep blocking, but that’s what the fans in Key Arena did last night while watching the exhibition match. The earliest advantage in a 1v1 Dota face-off comes with one side slowing down their support wave of AI creeps enough to force the opponent farther into enemy territory and that’s exactly what the bot managed to do within the first thirty seconds of the bout. After that, things seemed to even out but Dendi, lacking a good read on his AI rival, played cautiously and ended up losing out on experience and gold as the bot was given space to land more last-hits. By three minutes in, OpenAI had already harassed Dendi’s tower and gained double the CS. The former TI winner suffered his first death as a result shortly after. At that point, with the AI unlikely to make a crucial mistake and Dendi falling further and further behind in experience points, the game match was all but over. The pro tried to change things around with last ditch attempt at a kill but he ended up sacrificing his own life to do it. 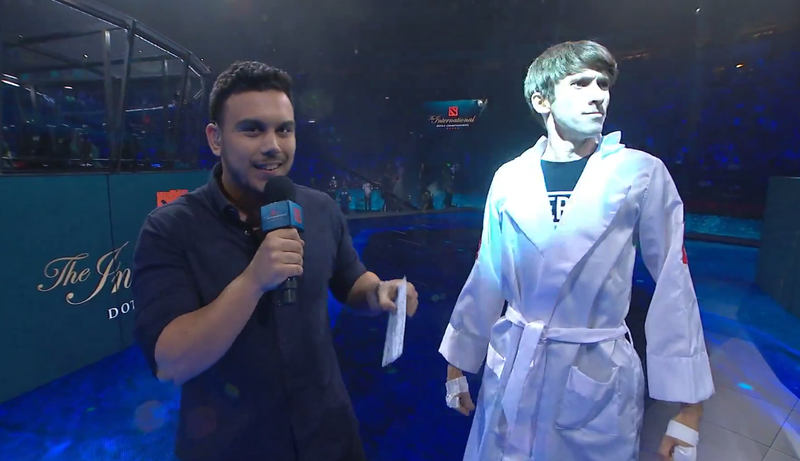 In a rematch, Dendi admitted that he was going to try and mimic the AI’s strategy of pushing his lane early, explaining how the dynamic of a 1v1 fight in Dota is counter-intuitive since it relies on purely outplaying your opponent rather than trying to out think them. Switching sides from Radiant to Dire for game two, Dendi got off to an even worse. He and the opposing AI exchanged blows early, and within the first two minutes he as forced to retreat only to die along the way. The OpenAI bot was trained, accroding to company CTO Greg Brockman, by playing many lifetimes’ worth of matches and only limited coaching along the way. Earlier in the week it had defeated other pros renowned for their technical play, including SumaiL and Arteezy, learning each time and improving itself. But these matches were more to test how far the bot had come than anything else. “Self-playing” was what got it to that point, with Brockman explaining in a blog post that the AI’s learning style requires playing against opponents very close in skill level so it can make incremental adjustments to improve over time. The company, funded in part by Elon Musk, is working on a number of different AI projects, including impersonating Reddit commenters, but games have always been an important part of designing and testing computer learning. From checkers and chess to StarCraft and now Dota, the well defined rule systems and clear win conditions are a natural fit. And the 1v1 mode of Valve’s MOBA takes that logic even further, offering a way of limiting the number of variables operating in the form of other players. Rather than worry about what nine other people are doing and exponentially increasing the number of options and possibilities the AI has to contend with, 1v1 allows it to focus the game’s core elements, similar a beginner chess player practicing openings. The OpenAI team’s ambitions don’t stop there, however. The bot’s designers hope to see it perform in full-fledged 5v5 matches by next year. You can watch the entire demo below.